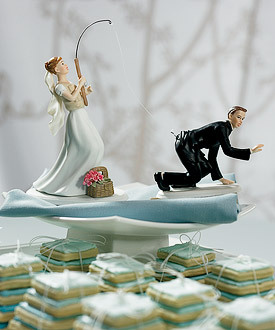 This is by far one of our most popular cake toppers! It is so comically cute. It could be used for the wedding cake or on a shower or groom's cake. Note that this set is available in Caucasian and Non-Caucasian versions & can be mixed between the bride and groom. It can be your's this week for $5 OFF the regular price just by ordering thru us now thru August 27, 2010. This takes the saying "Gone Fishing" to a whole new level. Fun and playful, this cake top can be used with equally playful tied bundles of tiered cookies or currently popular cup cakes . Hand painted porcelain.